You are here: Home / How To / How to Enable or Disable Cell Drag and Drop Editing Option in Ms Excel? In Microsoft Excel the cell drag and drop is missing. How to enable it? The cell drag-and-drop feature allows you to click a cell, hold the mouse button, drag the cell to another location on the spreadsheet and drop it. For some users this is an indispensable feature, but for others it’s an inconvenience that they can do without. In this post lets see how to enable or disable this excel feature. Click the Office Button. A menu will appear. 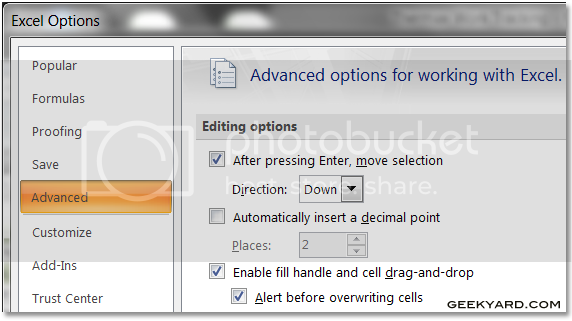 Under Editing Options, make sure that “Enable fill handle and cell drag-and-drop” is checked.